It’s impossible to miss the new buildings that have gone up in Edmonton over the last few years and, as the city skyline grows, so too does the space for mural and graffiti artists to shine. It’s a beautiful byproduct of a booming metropolis — the cranes complete their projects and put up walls for creatives to ply their craft. Edmonton hasn’t historically had an abundance of murals and street art to spare, but the Rust Magic International Street Mural Festival has done some serious work to change that, and fast. Since 2016, it has brought dozens of artists from Edmonton and around the world to adorn our city’s concrete canvases with 40 murals, none more eye-catching than the city’s biggest, on the south side of the Jefferson Lofts building on 106th Street, just south of MacEwan University’s downtown campus. Standing four storeys tall and stretching 36 metres across, the mural, painted by Spanish-based artist duo PichiAvo in summer 2018, is stunning in both size and style. 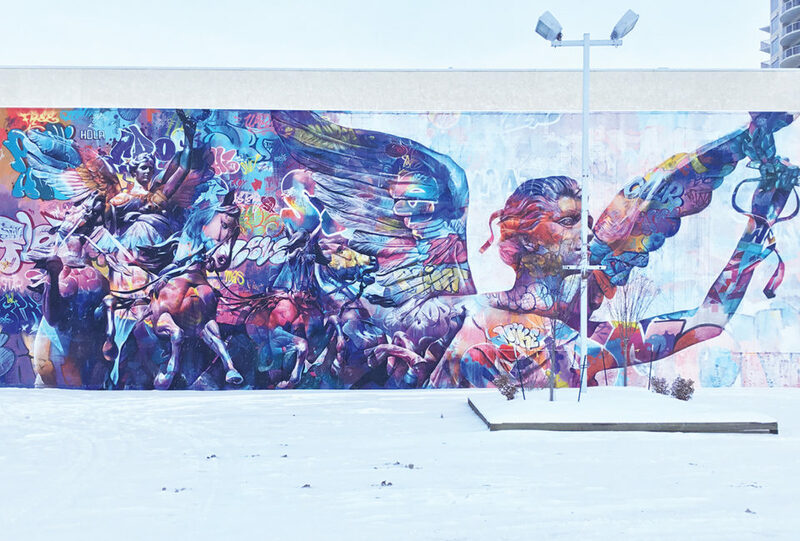 It’s the pair’s first mural in Canada, and like much of their previous work, it takes “mixing old and new” to the extreme by overlapping ancient Greek imagery with vibrant graffiti colour, portraying a pair of winged goddesses with laurel wreaths in their hands, watching for a worthy victor to anoint. Many people are unaware that the chalk-white busts we picture when we think of Greek sculptures were colourful and bright in their day (as well, the Great Sphinx of Egypt was yellow, red and blue). As a tribute to their artistic kin of eons past, PichiAvo paints their statuesque subjects as we see them today, but use bright graffiti palettes to bring them to life. The goddesses and their horses look simultaneously stone-like and clear and, without PichiAvo’s adept use of shadow and depth, the mural might be tough to look at, like a graffiti-filled Magic Eye picture. Instead, it’s a magnificent motley that requires more than a moment to mull over. The stigma of graffiti art has subsided over the years, but only to a point — it’s why the Rust Magic Festival uses the word “mural” instead — and a big part of the festival’s purpose is to bring out what the genre’s best artists like PichiAvo have to offer. As co-creators Annaliza Toledo and Trevor Peters point out, cities like Taiwan, New York, Auckland, and even Montreal and Vancouver have embraced mural festivals, so why not Edmonton? If their festival continues strong, they may run out of walls.